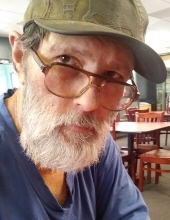 Jerry Leonard Ganey, 59, of Danville, Va., passed away Tuesday, January 15, 2019, at Sovah Health Danville. He was born July 2, 1959, in Danville to the late Roberta Bennett Ganey and the late Jack Ganey. Mr. Ganey worked at Star Paper Tube for many years prior to his decline in health. Mr. Ganey is survived by his wife, Pamela Barker Ganey; his son, Steven Ganey; and his sister, Betty McFarling. He was also predeceased by his brother Jimmy Ganey. A graveside service will be held at 1 p.m. Tuesday, January 22, 2019, at Danville Memorial Gardens. Norris Funeral Services, Inc. & Crematory, Mt. Hermon Chapel, 3995 Franklin Tpke., Danville, Va. is respectfully serving the Ganey family. Online condolences may be made at www.norrisfuneral.com. To send flowers or a remembrance gift to the family of Jerry Leonard Ganey, please visit our Tribute Store. "Email Address" would like to share the life celebration of Jerry Leonard Ganey. Click on the "link" to go to share a favorite memory or leave a condolence message for the family.